Did you lose your data when you removed your external device directly or the data has been corrupted when you removed from the USB port? Well, guys many people out there remove any external device which is connected to your PC or laptop via the USB directly and lose the data or sometimes get corrupted. Any external device like Hard drive, Pendrive or any other should be removed in a specific way if you want your data to be safe. Whenever you connect a USB Device to your computer then the External device will communicate with your hardware as well as the software and your PC will know that there is a new external device which is connected to the USB port. Now you will get the data from the USB device to your PC or from your PC to your USB device. once the transfer is done then you will remove the external device and some times it will be safe but sometimes you will get the data corrupted. so to prevent this loss of data then you have to make a habit of ejecting the device before you disconnect from the pc and below I am going to explain this briefly with the help of images & if possible video as well. Instead, you should right click on that device and select the option called Eject which is shown in the below image. It takes only a single click to eject your USB external device safely. When you eject the device your computer will stop communication between your PC as well as your external device which prevents in data correption. I hope you have understood why ejecting is very importand for external devices. 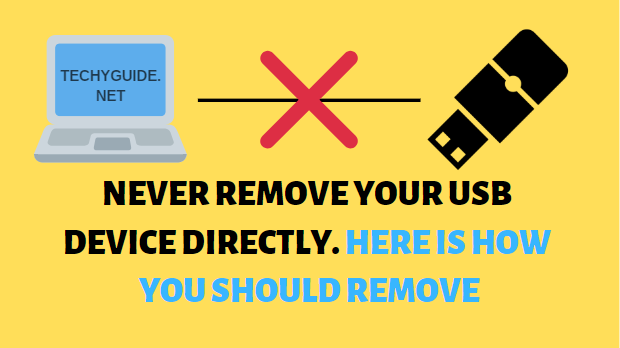 do share this information with your other friends so that they will never repeat this mistake again at the time of removing the external device. If you have ever faced the data correption then do let us know about it via the below comment section and if this helped you then also do comment below. Techy Guide Copyright © 2019.